Earth-friendly DIY Save the Date booklet made from Red Mango Tree-free + Recycled Paper. Rustic and rich! Binds with waxed linen thread. Booklet style Save-the-Date measuring 11" x 4.25" open. Cover made of tree-free mulberry and mango paper with two (2) printable sheets of 70 lbs post-consumer recycled paper. Red and husk rustic tones. 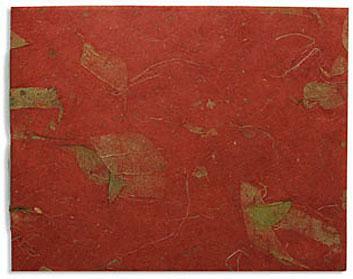 Red mulberry paper with golden colored mango leaves. Husk (the color of hay) printing sheets and envelope. Envelope liner made from matching red mulberry paper with real mango leaf inclusions. Cover Wrapper:Mulberry (tree-free) land mango leaves paper from Thailand. 11"x4.25"
Envelope: Matching husk post-consumer recycled A2 size - 5 1/2 inches x 4 1/4 inches. Envelope Liner: Mulberry and mango paper liner. Binding: Waxed linen thread used for pamphlet style sewn binding. 10% additional paper and envelopes for printing errors.